In the northern U.S., the modern equivalent, a rural or forest road created by the passage of motorized vehicles, is called a two-track road. But to answer your question, if the ruts developed naturally (were not intentionally built into the roadway, per the "rutways" answer), then I think the "2 track" answer holds. 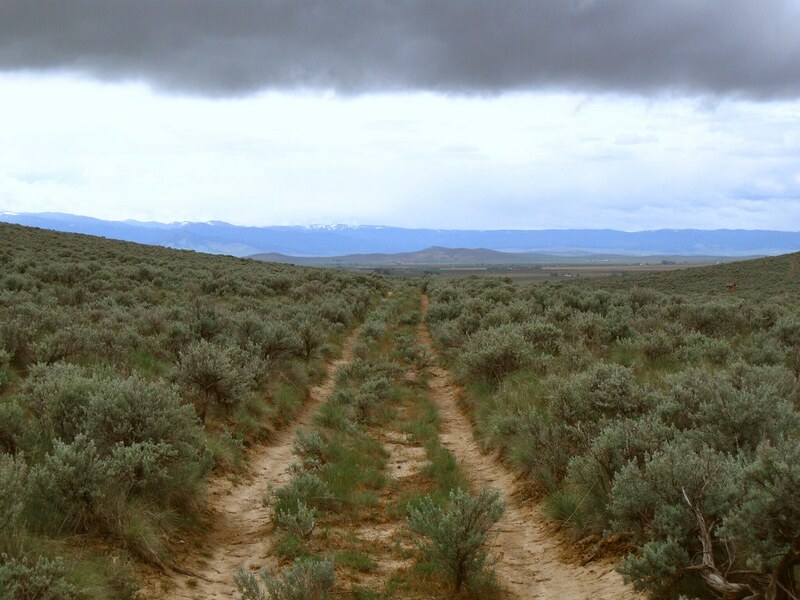 "The Oregon Trail is still visible in parts of the western US as a rutted 2 track through the prairie." Instant search was immediately made...when the child was found...apparently not much hurt! the skirts of its clothes were in the cart track. For some time after my departure from the village, I found a cart track, which served to guide me across one of the wildest and most extensive wastes, mosses, or muir, or rather, all three combined and commingled into one, in Scotland. But by-and-by this track began to diverge strangely, and subdivided itself into separate and almost invisible traces, and I was not a little puzzled, at times, to select, amidst such a perplexing variety. Another name, 'cart path', appeared in England's popular press rather than Scotland's. The term 'carriage path', like 'cart path', although I found examples in use in the 1820s, appeared in England and Ireland rather than Scotland. Likewise 'carriage track'. The term in use in Ontario, Canada, in and around 1865, is likely to have been affected by the scope of the locale; because of the diversity of the immigrant population, terms in use at that time might have been largely determined by (a) the cultural background of the speaker, and (b) the dominant cultural derivation of local communities. Perhaps due to limitations in the data available to me, I did not find examples of 'cart track', 'cart path', 'carriage path' or 'carriage track' from Ontario until the 1890s. At that time, 'cart track' was by far the most common. Cart-tracks? Or maybe cart-ruts or cart-road? Old roads in New England were named after the town they went to. So if a road leads from Lincoln to Concord, the half that's near Concord is called, "Lincoln Rd." and the half that's in Lincoln is called "Concord Rd." or maybe "Concord St." if it's heavily settled near town. Not the answer you're looking for? Browse other questions tagged nouns slang compound-words or ask your own question. What do you call the birthday of an organization? What does “We made the window” mean? What do you call the page you can bring to exams? What do you call the second word in the naming of sporting events, e.g. “basketball GAME,” “wrestling MATCH,” “track MEET”? Why is German anti-aircraft fire called “Archibald”? What is the meaning of “peel” in this passage?